On Monday after racing the Canada Cup in Mont Tremblant I flew to Czech Republic to compete in the 2015 World Cup opener. Going back to Czech was super exciting. I thoroughly enjoy the soviet feel of the area as well as the stellar course and arguably the biggest crowd of any World Cup on the circuit. The course is my favourite European course. It is more fun than most European World Cups – since it consists of real dirt, trails, and actual features. Some of the elements of the fabulous course are technical rock gardens (both up and down), lots of slippery roots that become more exposed as the race goes on and a sick BMX jump section. I had to relearn how to ride wet roots and rocks since my winter training in California consisted of only one day of rain…of which I did not ride. The start would prove to be exhilarating as most international events are. My call up was 68 and breaking out of three digit call-up numbers felt good. Off the start the usual pushing and shoving, bar locking, hip checks and shenanigans happened but it was nothing special. As the end of the start double track began to near the first downhill single track I was pleased with my position. The first downhill was the BMX, which was simple and wide enough to pass people if necessary. 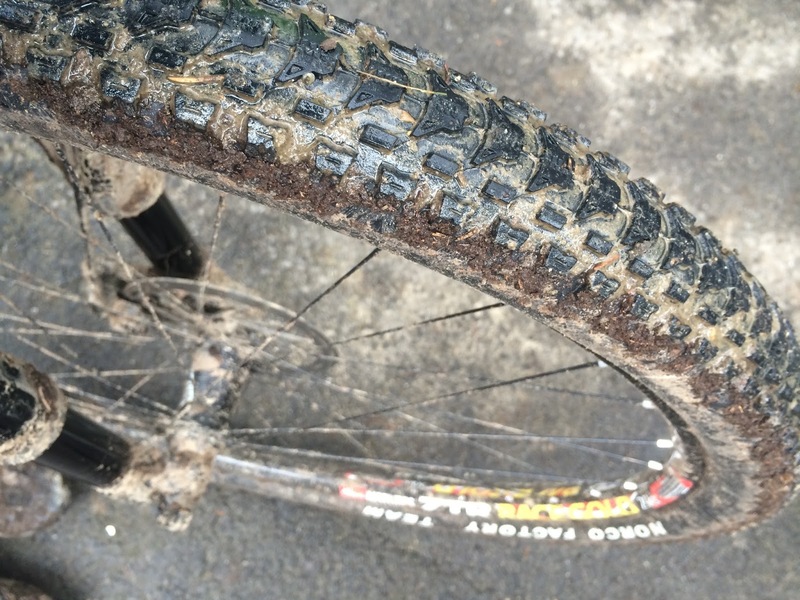 After this short bumpy break the course turns vertical with a rooty and rutted climb. I was caught between some guy and a tree when he spun out and fell into me therefore pinching me and allowing copious amounts of riders by. So much for my good start. I hit the first two laps hard and crushed some dreams. There were a few more cases of poor piloting and bad luck, whether it be slipping on rooty climbs or attacking a group only to get held up and caught again. However it’s just racing and these things are a part of it. Nearing the end of the race I was holding strong. I attacked the group I was with and was slowly bridging to a group of two. This would put me even closer to the top twenty if I could reach them. I put in the work and caught them as two riders behind me caught me as well. This was now a pack of blood thirsty animals. It seemed every single track we entered we entered as a group – so not one person wide but 4 or 5 wide. This caused a ruckus and forced guys to dab or slow up or spin out. It was a wonderful mess. At the beginning of the last lap I started to cramp hard. The very bumpy, rooty course did not help, as every bump was a stabbing pain through my back and sides. Unfortunately because of this I got separated from the group and caught by riders I had worked so hard to get away from. I kept my foot on the gas but it wasn’t really enough as 4 of them caught and passed me. I made a last ditch effort on the final two climbs to catch two riders in front of me. This last ditch effort also included taking a few risks on the descent but it was worth it. By the time we reached the last feature I had caught up to them so fast that I made a pass on the exit of that feature. Rad! This then put me second wheel going into the sprint. I was confident in my sprinting abilities and was ready to slay. As we kicked out on to the tarmac I locked out my fork, bent my elbow and got low. We hit the gas immediately. I was locked onto the Brazilian’s wheel in front of me. My eyes locked on his rear wheel and as I slowly brought it closer and closer to me I jumped out into the wind and crushed some dreams. With a nice bike throw at the end and a photo finish it wasn’t clear if I had achieved 26th or 27th at the 2015 World Cup opener. Unfortunately, both positions were out of UCI points but the result for a second year U23 was adequate. 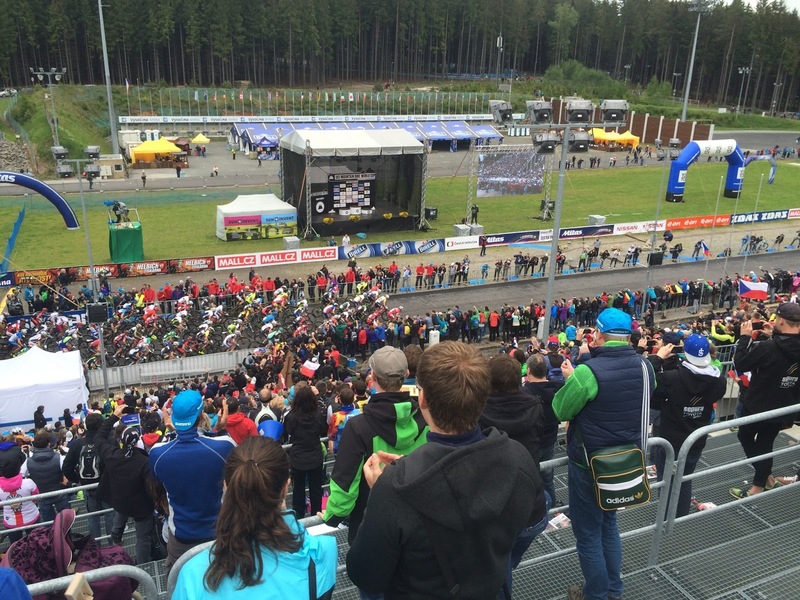 Later I would learn I won the sprint confirming my result of 26th here in beautiful Nove Mesto. 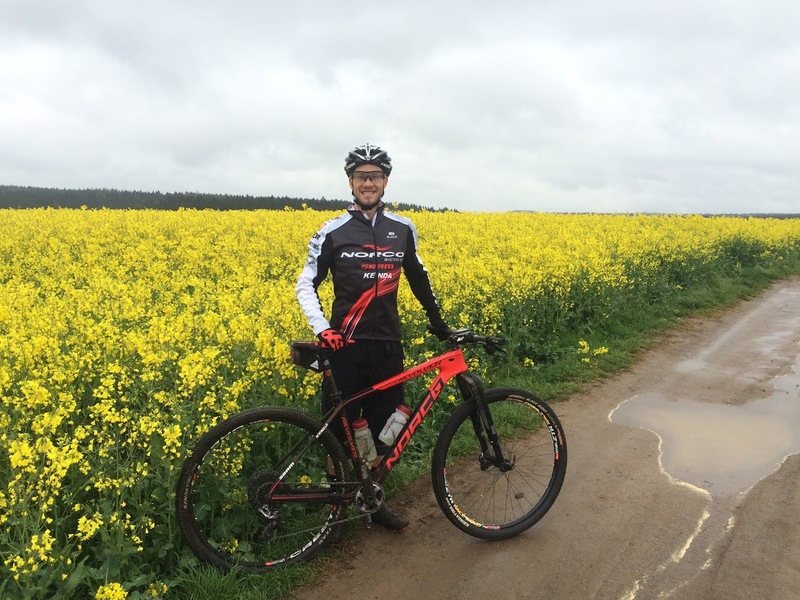 Then it was time to move to Albstadt, Germany. Keeping it short and sweet, Germany is neat but the course is not enjoyable. The very steep climbs and short, steep, unrewarding descents make it a pain to ride. Note I said pain to ride because when you race it becomes more painful. Although this is one of my least favourite courses, it is still a pretty good time. There are lots of spectators, good food close by and the bike paths surrounding the hotel and venue are vast. One night I wasn’t really in the mood to cook so I went to the local Doner spot – called Little Berlin. A nice place run by a father and son that speak no English. I got the “Big Doner” and it was massive. A pita stuffed with roasted chicken on a stick and veggies and more chicken and sauce – it was the size of a small child by the time it was finished. Man was it good. The race was pretty medium as far as excitement goes. This year Albstadt decided to throw in a 750m start loop, which is good as the course creates a huge bottleneck at the first steep climb. Starting 61st this round was an improvement compared to Czech but not by much. The start loop was fast, as it should’ve been, and I only moved up 20 spots. Upon the first climb the bottleneck still happened and we all were off our bike running up the monster of a steep climb. Not too much drama occurred in the first lap, some passing, some bottlenecks, a bit of swearing and relatively slow descending. As the race went on I began to pick off people. Moving up and up until I was in the 20s. Now that I was sitting comfortably in top 30, and by comfortably I mean in extreme pain on every climb, it was time to shake-and-bake. I put in a couple digs with the groups I was riding with in order to get into the downhill first. There I would let it all hang out and bridge to the next group on the downhill and start of the next climb. It was a good tactic until I caught the group riding for top 20. I had finally made the big leagues because these guys I couldn’t shake on the downhills and they had tons of power for the climbs. Going into the last climb of the race I was a part of a group with 5 other riders riding for 18th place. Some elbows were thrown, some passes made but when it was all said and done I did not land a top 20 finish. 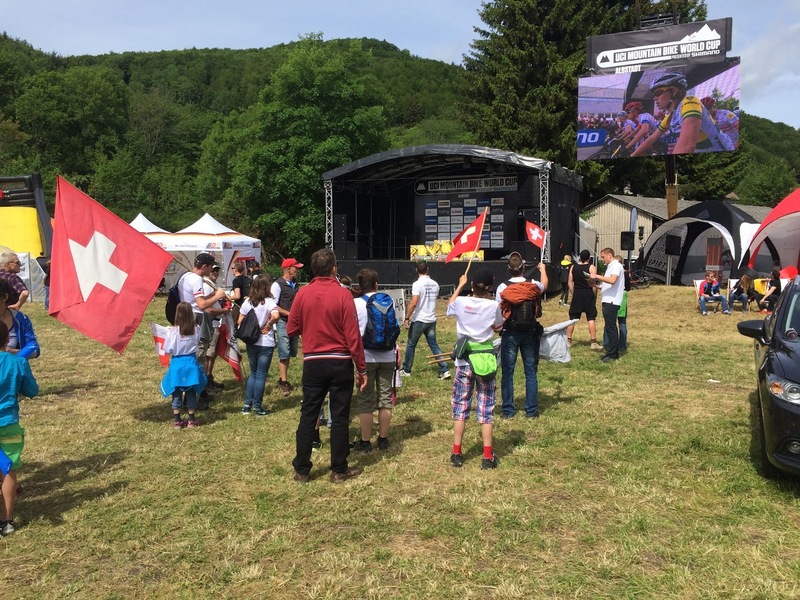 23rd was the verdict for Albstadt. All in all a great euro trip once again. Thank you to Cycling Canada and the staff for making it a success. Shout out to my teammate Haley Smith for a wicked result in Nove Mesto. Great time riding my Revolver 9 and can’t wait to put the gears to the euros again in Mont Ste Anne.